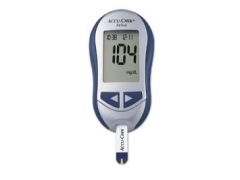 Non-glucose sugars contained in some therapeutic products such as peritoneal dialysis solutions and certain immunoglobulins can falsely elevate glucose results, which may prompt excessive insulin administration. These therapeutic products, which are labeled to indicate that they may interfere with this particular glucose monitoring technology, are mostly used in patients with serious medical conditions, including kidney failure and moderate to severe rheumatoid arthritis. Most GDH-PQQ devices are used in health care facilities, which should instead use a laboratory assay to measure a patient's glucose if the patient is also receiving an interfering product. The FDA also makes recommendations to minimize the risk of potential shortages of these products until health care facilities can obtain non-GDH-PQQ strips and meters.